Ever since the Promised Messiah (as) claimed to be the Messiah & Mahdi, opponents of Ahmadiyyat and the so-called Muslim scholars have been raising many allegations and objections against him. This is their habit and they will continue to do so. They are thus misguiding ordinary Muslims or at least they go on trying to misguide them. They continue to raise these allegations towards members of the Jama’at. Right minded individuals after examining literature of Messiah (as) realize that all these allegations are levelled for the sole purpose of creating disorder. Huzoor (aba) will allude to a few excerpts of the Promised Messiah (as) across his literature with regards to the status of the Holy Prophet (SAW) because all of them just cannot be mentioned in the time available. Huzoor (aba) has chosen a few excerpts from the Promised Messiah (as) various books ranging from Barahin-e-Ahmadiyya to his demise. The four parts of Barahin-e-Ahmadiyya were written from 1880 till 1884 and are compiled in Ruhani Khazain Volume One. In this book, he says at one place: That now, under the heavens, there is only One Prophet & only One Book, namely the Holy Prophet Muhammad, (SAW) who is higher and greater than all Prophets and more perfect and consummate than all Messengers and the Seal of the Prophets and the best of all humanity; by following whom God Almighty can be found and the veils of darkness are lifted and, in this very world, the signs of having achieved salvation, make their appearance. And the Holy Quran is the Book which contains the truth and perfect guidance through which one can acquire true knowledge and cognizance and the heart can be purified of all human impurities and a human being can be saved from the veils ignorance, heedlessness and doubt to enable him to attain to the stage of certainty of faith. The grandeur of the Holy Prophet (SAW) Grandeur and of the Holy becomes apparent from this excerpt. Then in the same book, Braheen e Ahmadiyya, the Promised Messiah (as) says: And this humble one is also from among the lowliest of the servants of that Glorious Prophet who is the Chief and Crown of all the Prophets of God. Thus, Divine Revelation is such a mirror that displays the perfect attributes of God as per the clarity and perfection of the person upon whom the revelation is being sent. This means that the degree to which the person receiving the revelation has a pure heart to that degree and rank of the Prophet of God are revealed the perfect attributes of God Almighty. And then the Promised Messiah (as) went on to say that because the Holy Prophet (sa) was greater than all Prophets. Hence God granted him the revelations of the highest degree. That purest of the souls deemed the highest degree of revelations being revealed to him. This highest condition was vouchsafed to one and only person in the entire world—namely the Perfect Man. He alone is the culmination and apex of human excellence. It is in his person that the evolutionary cycle of human potentiality reached absolute perfection. Indeed he is the last point on the higher scale of the extended line of God’s creation and constitutes the absolute pinnacle of all spiritual heights. Divine wisdom initiated the evolutionary process at the lowest level of creation with the meanest of creatures and caused it to attain the highest point, the other name of which is Muhammad—peace and blessings of God be upon him. The name Muhammad (sa) signifies the most praised one or the one who is the supreme embodiment of all perfection and excellence. Just as the Holy Prophet’s innate spiritual station was extremely exalted and so high and lofty, the quality of revelation vouchsafed to him was also very high. It is too exalted a station for me or the Messiah to attain. ‘That light of high degree that was bestowed on perfect man was not in angels, was not in stars, was not in the moon, was not in the sun, was not in the oceans and the rivers, was not in rubies or emeralds, or sapphires, or pearls; in short, it was not in any earthly or heavenly object. It was only in perfect man whose highest and loftiest and most perfect example was our lord and master, the Chief of the Prophets, the Chief of all living ones, Muhammad, the chosen one, peace be on him. That light was bestowed on this man and, according to their ranks, upon all those who bore the same colour to some degree. And by amanat [trust] are meant all those powers and abilities bestowed upon the Perfect Man, wisdom, knowledge, his heart, life, faculties, fear, love, honor and awe and the sum total of spiritual and physical blessings given him by God Almighty. And then the Perfect Man, in accord with the verse:Verily, Allah commands you to make over the trusts to those entitled to them (4:59); returns this entire trust back to God Almighty. That is to say becoming totally lost in Him devotes it all in His way, in His cause, as we have made clear all of this while discussing the reality and meaning of Islam. Blessed is he who stood up for the service of the faith. He stood up looking for the ways of winning the pleasure of Allah. In the name of Allah, the Most Gracious, the Ever Merciful. All praise belongs to Allah, Lord of all the worlds and we call down blessings and peace on the leader of the Prophets of God. The person who was above all, and was a perfect man, and a perfect prophet, and who came with the fullness of blessings, through whom, on account of his spiritual advent and the spiritual resurrection that he brought about, the first judgment manifested itself and a whole universe that was dead was revived, that blessed prophet Khatamul Anbiya, Leader of the elect, Katamul Mursileen, Pride of the Prophets was Muhammad Mustafa, peace and the blessings of Allah by upon him. O my Beloved God send down Thy Mercy and Thy blessings and upon this beloved Prophet which Thou hast never since the beginning of time sent down upon anyone. If this glorious Prophet had not appeared in the world then all those minor prophets who appeared in the world like Jonas, Jacob, or Messiah son of Mary, or Malakai, or John, or Zakaria etc etc we would have no argument in favour of their truth, even though all were the beloveds of God and near Him and handsome. This is the great favor of that Prophet that these were also considered to be true in the world. O Allah shower thy blessings on Muhammad and all his progeny and his Companions. And our last word is that all praise belongs to Allah, Lord of all the worlds. Opponents of Islam rely on mere tales and they defame Holy Prophet (sa). Our hearts are shattered when they make false allegations against Prophet Muhammad (sa) and hurl abuse at him based on pure fabrications. They say this about the one our definitive research shows to be the most pure and whom we consider to be the Seal of the Prophets. When we estimate justly, then out of the whole series of Prophets, we find one of high courage and alive and greatly dear to God, the Chief of the Prophets, the pride and the crown of the Messengers, whose name is Muhammad Mustafa and Ahmad Mujtaba [peace and blessings of Allah be on him]. By walking under his shadow for ten days one obtains that light which before him could not be obtained in a thousand years…. The signs of our Prophet Muhammad (sa) are of two types. The first are those that were shown at his hand or were manifested through his spoken word or action. Such signs number three thousand. And then there are those miracles that go on being manifested through his followers and such signs number in the hundreds of thousands. And no century has gone by in which such signs were not manifested. And in this era, through this humble one, God is displaying those signs once again. Through these signs we realize that the greatest and most beloved of Prophets is the Holy Prophet (sa) because the followers of other prophets are now lost in darkness and have with them nothing other than mere stories and tales. But the followers of the Holy Prophet receive in an ongoing manner fro God Almighty fresh signs. This is why amongst this ummat many such saintly people are found who have such cognizance of God that they have such a degree of certainty in God Almighty as if they see Him and the peoples of other Prophets do not have such a degree of certainty about God Almighty. Thus our soul bears testimony to the fact that the true and correct religion is Islam alone. We have seen nothing of Hazrat Isa (Jesus), peace be upon him. If the Holy Quran had not borne testimony to his truth it would not have been possible for us to have accepted him as a true prophet of God because when a religion remains left with nothing more than tales and stories the truth of the founder of that religion cannot be established based on such tales and stories. The reason is that stories that are hundreds of years old contain often falsehood within them – indeed this is what is more than likely since there is an abundance of falsehood in the world. So how can such tales be accepted as being true. The miracles of our Holy Prophet [peace and blessings of Allah be on him] are not mere stories. By obeying the Holy Prophet [peace and blessings of Allah be on him] we experience those signs ourselves and, through the blessings of observation and experience, we arrive at complete certainty. How high is the status of that perfect and Holy Prophet [peace and blessings of Allah be on him] whose Prophethood always furnishes fresh proof to seekers, and by the blessings of witnessing continuous signs, we arrive at the stage where we see God Almighty with our own eyes, as it were. Thus, true religion is that and the true Prophet is he, the fresh spring of whose truth should always be witnessed. To rely upon mere stories which are subject to all kinds of exceptions does not commend itself to the wise. Hundreds of people have been deified in the world and they are believed in on the basis of hundreds of old tales, but the truth is that the true miracle worker is he the river of whose miracles never dries up. That person is our lord and master the Holy Prophet [peace and blessings of Allah be on him]. In every age, God Almighty has raised someone to display the signs of that perfect and holy one. In this age, He has sent me with the title of Promised Messiah. Signs are being shown from heaven and all sorts of extraordinary events are coming to pass. Every seeker after truth can come and stay with me and witness these signs, whether he is a Christian, a Jew or an Arya. All these are the blessings of our Holy Prophet [peace and blessings of Allah be on him]. I say truly that he alone is the perfect man whose prophecies and acceptance of prayers and display of other miraculous matters is something which even now rages like the ocean through his true followers. Which other religion beside Islam possesses this quality and this power? Where are the people, and in which country do they dwell, who can compete with Islam in the matter of Divine blessings and signs? There is no book on the face of the earth for mankind except the Quran. All of mankind has no Messenger and Intercessor butMuhammad Mustafa [the Chosen One], peace and blessings of Allah be upon him. Endeavour to cultivate true love for this Prophet of dignity and majesty, and do not give any sort of preference to anyone else over him, so that in Heaven you may be counted as those who have attained salvation. Remember, salvation is not something that will be manifested after death. On the contrary, true salvation exhibits its light in this very world. Who is the one who attains salvation? Such a person is he who believes that God is true and that Muhammad, may peace and blessings of Allah be upon him is the intercessor between God and all of His creatures and that there is no Messenger equal to him in rank under heaven, nor is there any book equal in status to the Holy Quran. God did not desire that anyone else should remain alive eternally, but this Chosen Prophet lives forever. Our soul and every particle of our being are prostrate before the Mighty, True and Perfect God from Whose hand every soul and every particle of creation together with all its faculties came into being, and through Whose support every being is sustained. Nothing is outside His knowledge, outside His control, or outside His creation. We call thousands of blessings and peace and mercy on the Holy Prophet Muhammad, the chosen one [peace and blessings of Allah be on him] through whom we have found the Living God Who gives us proof of His existence through His Word. He demonstrates to us through extraordinary signs His shining countenance which possesses eternal and perfect power. We found the Messenger who manifested God to us and we found the God Who created everything through His perfect power. How majestic is His power that nothing came into being without it and nothing can continue to exist without its support. That True God of ours possesses numberless blessings, numberless powers, numberless beauties and beneficences. There is no other God beside Him. Thus these religions came to suffer from such ills, some of which are unspeakable and even repugnant to the purity of the human self. All these symptoms were conditions precedent to Islam. A reasonable person would admit that sometime before the advent of Islam all faiths had become corrupted and had lost spirituality. Thus, our Holy Prophet was the Greatest Reformer who brought the lost truth back into the world. No Prophet shares with our Holy Prophet the distinction that he found the entire world steeped in darkness and he turned its darkness into light; nor did he die until the entire people among whom he appeared had shed the garb of Shirk (associating partners with God) and put on the gown of Tauhid (Unity of God). Not only that, but they attained the highest levels of faith. They displayed such unprecedented sincerity, faithfulness and certainty as was not to be found anywhere in the world. No Prophet of God ever achieved such a kind and degree of success except the Holy Prophet. The prime argument in favour of the Holy Prophet’s Prophethood is that he graced the world with his presence at a time when it was steeped in darkness and was in dire need of a great reformer, and he did not die before hundreds of thousands of people had abandoned Shirk and idol-worship and had adopted Tauhid and the right path. None but the Holy Prophet could have brought about this great reformation. He taught human values to a people who were savages and brutes. In other words, he transformed brutes into men, men into civilized men, and civilized men into godly men. He infused spiritual qualities into them and established their communion with the True God. In His path they were slaughtered like goats and trampled underfoot like ants, but they held fast to their faith and kept marching forward in the face of every hardship. Our Holy Prophet was undoubtedly the Second Adam by virtue of establishing spirituality in the world. Rather, he was the true Adam, as it was through him that all human virtues reached their perfection, all the forces for good became active in their respective spheres, and no branch of human nature was left fruitless. The finality of Prophethood in his person consists not only in his being last but also in the fact that all the perfections of Prophethood culminated in him. Since he was the perfect manifestation of Divine attributes, the Law he brought contained the qualities of glory as well as of beauty. His twin names, Muhammad and Ahmad, symbolize the same reality. His universal Prophethood does not partake of any parsimony, but was from the very beginning meant for the entire world. God be thanked a thousand times, Who has bestowed upon us a religion, which is such a means of attaining to the knowledge of God and to the fear of God, as has had no equal in any age. Thousands of blessings be upon the immaculate Prophet through whom we have entered this faith and thousands of Divine mercies be bestowed upon his companions who irrigated this garden with their blood. And in the end all such people met their destruction. I always wonder how high was the status of this Arabian Prophet, whose name was Muhammad, (thousands of blessings and peace be upon him). One cannot reach the limit of his high status and it is not given to man to estimate correctly his spiritual effectiveness. It is a pity that his rank has not been recognized, as it should have been. He was the champion who restored to the world the Unity of God which had disappeared from the world; he loved God in the extreme and his soul melted out of sympathy for mankind. Therefore, God, Who knew the secret of his heart, exalted him above all the Prophets and all the first ones and the last ones and bestowed upon him in his lifetime all that he desired. He is the fountainhead of every grace and a person who claims any superiority without acknowledging his grace is not a man but is the spawn of Satan, because the Holy Prophet has been bestowed the key to every exaltation and he has been given the treasury of every understanding. He who does not receive through him is deprived forever. I am nothing and possess nothing. I would be most ungrateful if I were not to confess that I have learnt of the true Unity of God through this Prophet. The recognition of the Living God we have achieved through this perfect Prophet and through his light. The honour of converse with God, through which we behold His countenance, has been bestowed upon me through this great Prophet. The ray of this sun of guidance falls like sunshine upon me and I continue illumined only so long as I am adjusted towards it. Now by all that we have stated our purpose is to state that Allah, the Exalted, has made his granting His love to anyone conditional upon such a person following the Holy Prophet. Thus it is my personal experience that to obey the Holy Prophet [peace and blessings of Allah be on him] with a sincere heart and to love him, ultimately makes a person beloved of God. God creates in his heart a burning for His Own love and such a one, withdrawing his heart from everything else, leans towards God and his affection and desire remain only for God Almighty. Thereupon a special manifestation of Divine love falls upon him and, bestowing upon him the full colour of love and devotion, pulls him towards itself with great force. He then overcomes his passions and from every direction extraordinary works of God Almighty appear as signs in his support and to help him. I have, by the sheer grace of God, and not on account of any merit of my own, been accorded a full measure of the bounty, which was bestowed before me on the Prophets and Messengers and the Chosen ones of God. It would not have been possible for me to be granted this bounty had I not followed the ways of my lord and master, the Pride of the Prophets, the Best of Mankind, Muhammad (sa). Whatever I have been given, I have been given due to this adherence and I know through my true and perfect knowledge that no man can reach God except through following the Holy Prophet nor can anyone arrive at a full understanding of God except through him. Now, let me also make it known that the very first thing you are rewarded with, after having completely submitted yourself to the instructions and teachings of the Holy Prophet Muhammad (sa), is that you are granted a new heart which is always rightly inclined, that is to say, a heart which has turned cold upon the love of this material world, and instead it begins to yearn for an everlasting heavenly pleasure. Having achieved this desire this heart is now fir to receive that perfect and purest love – the love of God. Because of your complete obedience to him, all these blessings are bequeathed to you as his spiritual heritage. There have been millions of pure-natured people in the world and there will be more in future, but we have found the best of all of them and the highest man of God, whose name is Muhammad [peace and blessings of Allah be on him]. Whose threshold is safeguarded by the Holy Spirit. To recognize him is to recognize God. How shall we express our gratitude to God who bestowed upon us the good fortune to follow the Prophet who is a sun for the souls of the righteous as there is a sun for the bodies. He appeared in a time of darkness and illumined the world with his light. He was neither tired nor fatigued till he purified all parts of Arabia from associating partners with God. He is the proof of his own truth for his light is present in every age and true obedience to him purifies a person as the clear and transparent water of a river cleanses dirty linen. Who has come to us with a sincere heart and has not witnessed that light, and who has knocked honestly on that door for whom it has not been opened? But the pity is that most people prefer the lower life and do not desire that higher light should enter into them. It is worthy of consideration whether this glory, this splendour, these thousands of heavenly signs and Divine blessings can be bestowed upon a false one. We take great pride in the fact that the Holy Prophet [peace and blessings of Allah be on him] to whom we have attached ourselves, was bestowed great grace by God. He is not God, but through him we have seen God. His religion which has come to us is a mirror of Divine Powers. Had it not been for Islam, it would have been difficult in this age to appreciate what Prophethood is and whether miracles are possible and whether they are part of the law of nature. This puzzle was resolved by the eternal grace of that Prophet and it is due to him that we are not mere story-tellers like other people, but enjoy the support of God’s light and His heavenly help. We are unable to express adequately our gratitude that God Who is hidden from others, and the inner power which is beyond the concept of others, and the Lord of Glory, have been disclosed to us by the Holy Prophet [peace and blessings of Allah be on him]. So the real complaint of these religious divines is that why did Allah speak with the Promised Messiah because of his total love for and obedience to the Holy Prophet. And why did He bless him with His nearness. It is not the Jama’at Ahmadiyya that is guilty of this crime but rather these so-called religious divines that the blessings of the Holy Prophet are, God forbid, no longer available and that the powers and attributes of Allah, the Exalted, have now become limited. If this allegation fits upon anyone it fits upon these people. The Promised Messiah (as) says that God’s powers are still continuing. Then when our Holy Prophet (sa) came into the world a very great revolution took place in the world and within a short time that island of Arabia which knew of nothing other than idolatry became filled like unto a sea with the Unity of God. The miracles and signs that were bestowed by God Almighty on our lord and master, the Holy Prophet [peace and blessings of Allah be on him] were not confined to his time, but will continue till the Day of Judgement. In the past ages, no Prophet was included among the followers of another Prophet, though he helped the faith of the previous Prophet and believed in him, but the Holy Prophet [peace and blessings of Allah be on him] has been bestowed this special honour that he is Khatam-ul Anbiya’; one, because he achieved the climax of all the excellences of Prophethood; and, secondly, because there will be no Prophet after him who would bring a new law nor any Prophet who is not his follower. Everyone who is honoured with converse with the Divine, achieves it through his grace and through his mediation and is known as his follower and not as a direct Prophet. He has been accepted to such a degree that today a minimum of 200 million people of every rank are Muslims and stand before him as his servants. [Huzur Aqdas explains that these were the numbers at the time of the Promised Messiah (as)] Great and powerful kings who conquered a portion of the world, fell at his feet like humble slaves. Even today, Muslim kings regard themselves as his humble servants and descend from their thrones at the mention of his name. Muslims all across the world feel great pride in associating with Holy Prophet (sa). If we were not believers of Messiah (as), we couldn’t understand intricate details of the status of Holy Prophet (sa). Some allege, Messiah (as) changed his beliefs overtime. 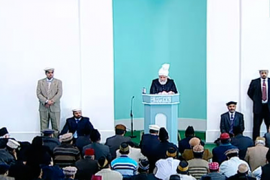 Huzoor (aba) presented excerpts from start of the claim to his demise. All excerpts presented show coherence. If Promised Messiah (as) referred to himself as a Prophet, it was as a follower Prophet. May Allah enable us the proper understanding needed reach the Holy Prophet (sa). Aameen.